First Aid | SAMARITAN INTERNATIONAL e.V. 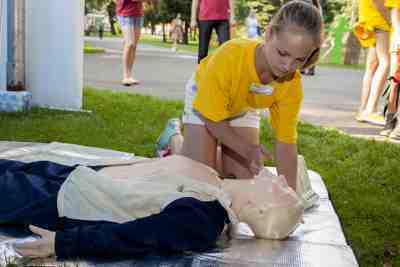 Everybody can learn to provide first aid! All member organisations of SAMARITAN INTERNATIONAL consider this a basic fact. Not all measures that are necessary in an emergency can be acquired from printed words or pictures. For essential practical measures it is of great advantage, not only to the patient, to have learned and trained the live-saving and helpful actions under supervision in a practical course. This way, first helpers can act with confidence, should the need arise. Teaching staff can assist with the exercises and correct mistakes. Training helps to acquire the confident mindset “I can help”. This strengthens the capacity to act in those tough situations, that can unexpectly enter everyday life. Everybode does of course hope to never be confronted with such emergencies. However, it is good to know how to act should the need arise. The member organisations of SAMARITAN INTERNATIONAL offer their local populace first aid training according to comparable standards. These have been jointly defined by the working group EC First aid and can be officially certified. SAM.I. advocates for mutual recognition of first aid certificates within the European Union, based on defined high-quality learning results and the European Qualifications Framework. As a practical initiative toward this goal, the SAM.I. members have defined an internal European First Aid Certificate that is meant to facilitate recognition of national first aid certificates among the member organisations. To motivate our youth to acquire first aid knowledge, we organise the bi-annual SAMARITAN contest. As an associated partner in the QuestCity project, we also support the creation of new first-aiders by means of new media. This year, SAMARITAN INTERNATIONAL promotes first aid training for young people under the motto “Youth Engaged in First Aid – Heroes without Superpowers“.